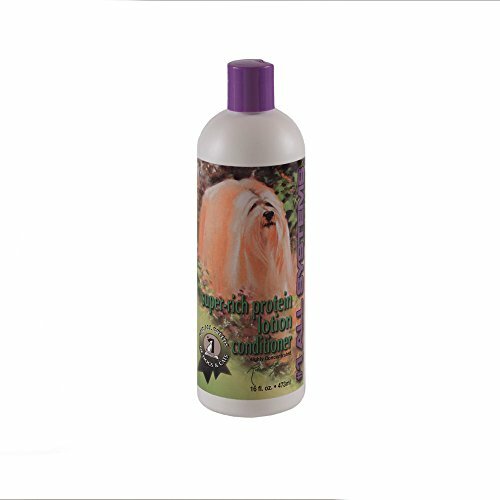 This super-rich protein lotion conditioner detangles and builds coat body. An excellent antistatic agent. It keeps especially harder-textured coats looking and smelling great longer. Dilutes 1-2 tablespoons per 32 ounce of water. Super-rich protein lotion conditioner comes in 16-ounce size. ingredients are deionized water, stearylkonium chloride, cetyl alcohol, stearyl alcohol, PEG-100 stearate, dicetyldimonium chloride, stearamidopropyl dimethylamine, glycol stearate, ceteth-2, propylene glycol,hydrolized vegetable protein, triethanolamine, methylyparaben, fragrance, citric acid. Measures 8-inch length by 2-1/2-inch height by 2-1/2-inch width. If you have any questions about this product by #1 All Systems, contact us by completing and submitting the form below. If you are looking for a specif part number, please include it with your message.